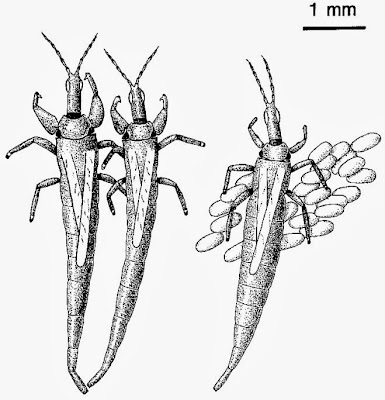 Fighting males of Elaphrothrips tuberculatus, with a female guarding an egg-mass, from Crespi (1986). 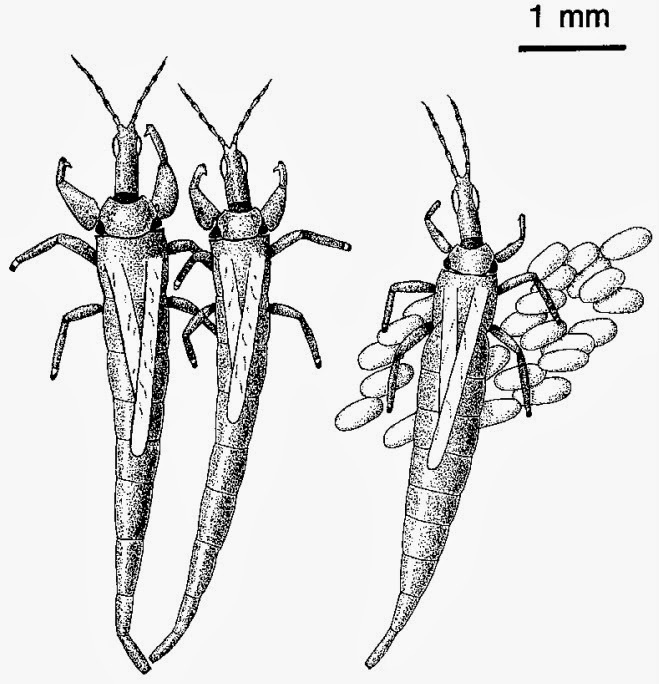 Elaphrothrips is a diverse, primarily pantropical genus of fungus-feeding thrips. Over 100 species are currently recognised in the genus, though some less-studied species may prove to be synonymous (Mound & Palmer 1983). Characters (from Mound & Palmer 1983): Large, dark species; head without complex sculpture. Eyes not prolonged ventrally. Fore-ocellus anterior to major ocellar setae. Males with pronotum not produced at anterior angles; fore-femora often with a stout, sickle-shaped seta, without tubercle on inner margin. Abdominal tergites usually with two pairs of major wing-retaining setae (one pair in Elaphrothrips antennalis), larger individuals may have several pairs of supplementary sigmoid setae anterolateral to major pairs. Tube without long lateral setae. Crespi, B. J. 1986. Size assessment and alternative fighting tactics in Elaphrothrips tuberculatus (Insecta: Thysanoptera). Animal Behaviour 34: 1324-1335. [G28] Girault, A. A. 1928. Some Insecta and a new All Highness. Privately published (reprinted Gordh, G., A. S. Menke, E. C. Dahms & J. C. Hall. 1979. The privately printed papers of A. A. Girault. Memoirs of the American Entomological Institute 28: 225-228). [G29] Girault, A. A. 1929. Description of a case of lunacy in Homo and of six-legged articulates. Privately published (reprinted Gordh, G., A. S. Menke, E. C. Dahms & J. C. Hall. 1979. The privately printed papers of A. A. Girault. Memoirs of the American Entomological Institute 28: 262-265).